Why is Highland Beef Better? 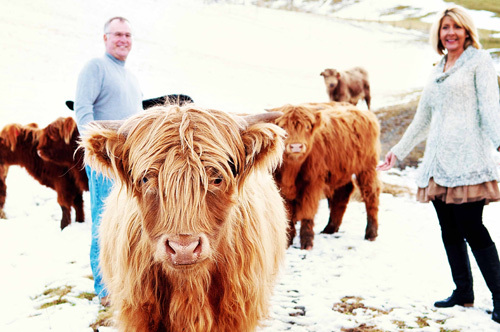 Highland Meadows Cattle Co. is a family-owned and operated farm in Lansing, NC – a region known as the High Country. Our farm is located in beautiful Ashe County. 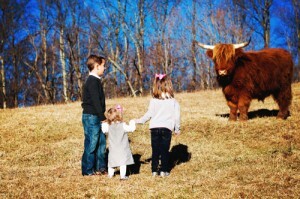 We first saw Highland Cattle in a pasture on the Blue Ridge Parkway 8 years ago and bought two as pets. Blondie and Big Red still rule the farm but we fell in love with the hardiness and good temperament of the breed and decided to increase our fold. We now sell our delicious all natural beef at our farm and at the Ashe County Farmers Market in West Jefferson on Saturdays. We also sell breeding stock, please check with us for availability. The farm is over 100 years old and we are striving to bring it back to its original splendor. We are currently on the study list for the National Historic Registry. The spring house still runs, the old barns are still standing and are in use, we raise chickens in the original coop, bees and a big, lovely garden in summer and fall. There are many apple, pear, cherry and walnut trees as well as sugar maples which we will be tapping for syrup next year. Even the old outhouse is still in place – but no longer in use!! The many natural springs, babbling brooks and high mountains make this a little piece of Heaven for us. Not to mention our fold of beautiful Scottish Highlanders! Please call us and come to visit, we would love to show you around our farm! Contact Us Today and Try Our Beef! I love this beef! Great on the grill! And Carolyn and Tim are the nicest folks to do business with! © Highland Meadows Cattle Co.